To Cite: Akbari A, Baezzat F, Abbasi-Asl R. A Study of Factor Structure and Psychometric Adequacy of the Educational Stress Scale (ESS), Int J School Health. 2018 ; 5(2):e63128. doi: 10.5812/intjsh.63128. Background: The concept of educational stress is considered an important construct in education and has attracted the attention of many researchers. Objectives: This research was conducted with the goal of investigating validity, reliability, and factor structure of Sun, Dunne, Hou and Xu educational stress scale in Iranian high school students. Methods: By using random cluster sampling, 300 high school students (male and female) were selected from Babolsar city as participants for this research. Participants completed the educational stress scale and data were analyzed using Amos (v. 22) and SPSS (v. 22) software. Factor analysis was performed by exploratory and confirmatory analysis. Results: The results of factor analysis revealed the presence of 4 dimensions (workload and pressure from study, self-expectation, worry about grades, and despondency). The internal consistency estimate of reliability for this scale and subscales were in the range of 0.63 to 0.80. Conclusions: The results illustrated that this scale has goodness of fit and could be applied in related research. In the realm of human life, there is no escape from exposure to diverse situations. Some of these situations may be challenging and beyond the power of the person, thus leading to stress if the person fails to properly deal with them (1). According to McEwen and Stellar (2), human perception of different situations is different from each other, which means that a challenging position could cause varying degrees of stress in people. Although research suggests that there is a relationship between stress with a variety of diseases (3), many believe that if there is no stress, life could be boring and pointless and stress is a negative factor only when it impairs mental health and is harmful to physical health (4). Researchers have defined different types of stress, according to people’s position, including educational stress. Educational stress can be defined as the emotion that emerges from expectations related to studies, expectations that are beyond one’s ability. Lal (5) considers educational stress as a result of some kind of mental confusion caused by academic frustration of study or educational failure. He adds students in their school life face different situations, such as semester exams and class quizzes, situations in which they are expected to be successful and do well. He says, understanding what the teacher is saying, competing with other students, and meeting teachers and parents expectations that may be beyond the ability of the individual, could cause stress for the individual. Researchers have mentioned various factors for educational stress. Mulyadi, Rahardjo, and Basuki (6) introduced a defective parent-child relationship and lack of ability to meet the expectations of others as the determinants of educational stress. Rao (7) said, that parents, who have high expectations from their children, increase their child’s educational stress. Ghosh (8) states that parents, who do not support their children emotionally and lack positive coping mechanisms to deal with stress factors, exacerbate stress in their children. Since stress is inevitable in the educational environment and can cause a variety of psychological and behavioral problems (7), many researchers in the field of behavioral science research have conducted studies in the field of stress and its consequences. At the same time, previous findings show that the issue deserves further attention and study (8). In this regard, Sun, Dunne, Hou and Xu (9), operationalized and examined the concept of educational stress. The result of their study was the development of the educational stress scale. This scale has 16 items and 5 distinct dimensions, and provides an acceptable and a clear picture of dimensionality, reliability, and validity of educational stress. Thus, this study was designed to evaluate the psychometric properties of this scale. 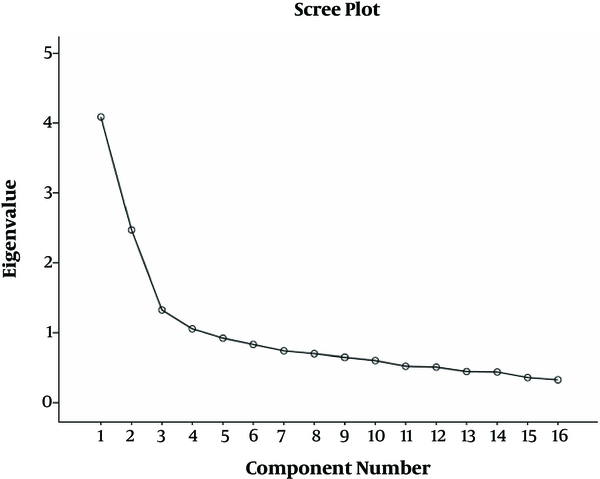 This study intended to examine the stress scale after administration on an Iranian sample, and its psychometric properties were evaluated in terms of validity, reliability, and dimensionality. This research was conducted with the goal of investigating validity, reliability, and factor structure of Sun, Dunne, Hou, and Xu’s educational stress scale with a sample of Iranian high school students. This research was a correlational study. Participants of this study included 300 (female and male) high school students from Babolsar city, Iran (2015 to 2016 academic year), who were selected by random multi-stage cluster sampling. It was explained to participants that the information obtained from this study will remain confidential and will be used only in a research work; also, it was noted that participation in this study was voluntary. Finally, 300 questionnaires were collected from the students yet 27 were incomplete and only 273 questionnaires were entered in the data analysis. Educational stress scale was built by Sun et al. (9). This instrument is a self-reported scale that includes 16 questions to assess 5 factors of Educational Stress, including Pressure from study (PF), self-expectation (SE), worry about grades (WG), Despondency (D), and workload (w). Sixteen items are proposed in a 5-point Likert scale (from disagree to agree), scored 1 to 5, respectively. Sun et al. (9) selected 347 high school students with a mean age of 15.37 (SD = 1.69). Primary form of the scale included 30 items and after exploratory and confirmatory factor analysis, 16 items remained. Pressure from study (4 items), self-expectation (3 items), worry about grades (3 items), despondency (3 items), and workload (3 items) presented 63.6% of the variance of the ESS scale. Sun et al. (9) for measuring the validity of the scale, used factor analysis by principal component analysis and Varimax rotation, the results of which showed KMO and Bartlett coefficients were significant and acceptable. Also, they used Cronbach alpha to measure the reliability of the scale. All questions scored positively on this scale and a higher score reflected higher stress of education. To use this scale in the present study, first the original scale was translated from English to Persian and after necessary modifications, the content of questions and instructions were reviewed and approved by a number of psychology experts. This scale has been proposed by Lovibond and Lavibond (10) to measure depression, anxiety, and stress, consisting of 2 short and long forms. The short form consists of 21 four-point questions scaling from 0 (totally agree) to 3 (totally disagree), each emotion is measured by 7 questions. In Iran, Samani and Jokar (11) measured the validity and reliability of this scale. They calculated the reliability of this scale using Cronbach’s alpha coefficients of 0.90, and to verify the validity, the main components were used for factor analysis. The load factor was reported for depression from 0.76 to 0.36, and from 0.73 to 0.39 for anxiety. In the present study, reliability was tested by Cronbach’s alpha coefficient, where the obtained coefficient was 0.85. The internal consistency was used for validity, and the obtained coefficient varied from 0.37 to 0.68 for this scale. This scale includes 25 items and was built by Conner and Davidson (12). It uses a Likert scale from 1 (absolutely incorrect) to 5 (absolutely correct). The validity of this scale was approved using methods of factor analysis and its reliability was tested by Cronbach’s alpha on various groups (normal and at risk) (12). In Iran, Samani et al. (13) reported the reliability of the scale, by using Cronbach alpha of 0.83, and in the current study, reliability was also measured by Cronbach alpha, which was 0.83. Also, the internal consistency was used for validity and the obtained coefficient varied from 0.37 to 0.70 for this scale. In this research, the mean and standard deviation were used as descriptive statistics, and Pearson correlation coefficient was used to assess the correlation between the variables. Factor analysis was done by exploratory and confirmatory analysis. All data were analyzed using the SPSS (v.22) and AMOS (v. 22) software. To evaluate the reliability and validity of the scale, an item analysis was performed on the scale. The result of this analysis indicated that all of the questions had a significant correlation with the total score (0.27 to 0.64). It was ensured that the questions are sufficient, and the final analysis of data was performed using principal components and the Varimax method. The results of exploratory factor analysis showed that KMO coefficient value for this analysis was equal to 0.79, which indicates that the data is suitable for factor analysis (14). To determine the significance of the correlation matrix, Bartlett’s test was used. The coefficient obtained from this test was 1140.18, which is statistically at a level of P = 0.01. The results ensured that factor analysis could be run (14). 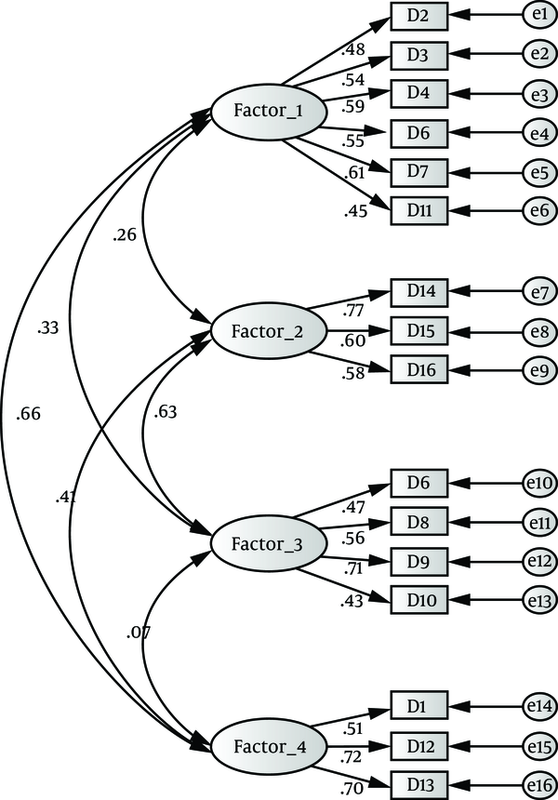 By running factor analysis on the scale items through principal components method and regarding the eigenvalues over one, the existence of 4 factors was confirmed (Figure 1). This 4 factors presented 55.89% of variance of the educational stress scale. Because the amount of explained percentage of variance is more than 50%, it could be said that the 4-factor structure of the scale, is an optimal structure (13). In addition, the results of the factor analysis indicated a favorable convergent of validity of this scale. The content of scale items and factor loading for each dimension are shown in Table 2. The question items were scored on a 5-point Likert scale (from disagree to agree) from 1 to 5. As Table 2 shows, the factor loading of items related to WPS varied from 0.528 to 0.729 and the factor load of items related to SE varied from 0.615 to 0.792. Also the factor load of items related to WG varied from 0.514 to 0.770, and those of D varied from 0.563 to 0.856. In Table 3, the correlation coefficient between each dimension score and the total score, as well as the score of dimensions with each other was calculated. aAll coefficients are significant at 0.01 level. In addition, to determine the convergent and divergent validity of extracted factors, their correlation was calculated with Conner and Davidson Resilience scale (12) and Lovibond and Lovibond negative emotions scale (10), and the results indicated the desirability of convergent and divergent validity scale. bAll coefficients are significant at 0.05 level. To examine the reliability of the 4 dimensions as well as the reliability of the scale, internal consistency was used. One of the most common indicators of internal consistency was the Cronbach’s alpha coefficient (15). The results showed the Cronbach alpha coefficients for the subscales of workload and pressure from study, self-expectation, worry about grades, despondency and total score of ESS were 0.75, 0.66, 0.63, 0.71, and 0.80, respectively. The descriptive findings, including mean and standard deviation, minimum and maximum score of each dimension and total score of ESS are shown in Table 5. Finally, in order to assess the fitness of the 4-factor structure of the scale, AMOS-22 and confirmatory factor analysis was used; results are shown in Figure 2 (all regression weights are significant at 0.001 level). According to the indices obtained in Table 6, it could be concluded that the Persian version of four-factor model of educational stress had a good fit in Iranian students. In this study, the psychometric properties of the educational stress scale were examined. Validity was among the most important features for the use of the scale. In this study, to evaluate the scale of validity, content validity, construct validity, convergent, and divergent validity were used. Content validity indicates that the items or content of scale are representative of defined or measured characteristics (16), and according to the study by Sun et al. (9) and the theoretical principles outlined on the 4 dimensions, it could be concluded that the scale had acceptable content validity (with the difference that in this study, the 2 dimensions of Workload and Pressure from study were merged into 1 dimension). In addition, the coordination of factor structure of this scale with its theoretical structure (9) is the most important index for verifying its validity. In this regard, Kerlinjer (16) stated that in construct validating, factor analysis was a powerful and inevitable method. In this regard, according to the indicators obtained, it could be argued that the validity of the scale was satisfactory. In addition, studies have shown that academic stress has a positive correlation with negative emotions (17). This study showed that EES scores had a positive significant association with negative emotions. Also, many studies have shown that academic stress has a negative correlation with resiliency (18). The results of this study showed that educational stress had a negative and significant relationship with resiliency. Therefore, convergent and divergent validity of this scale was acceptable. In order to examine the reliability of the instrument, internal consistency was used. The results showed that each of the dimensions and the total scale had good reliability and the coefficients obtained varied from 0.63 to 0.80. The results of data analysis suggest that the used scale had a good validity and reliability and could draw an acceptable and reliable picture from this construct; also, the results of the factor structure are similar to the findings of the Sun, Dunne, Hou, and Xu (9) with the difference that in this study, the 2 dimensions of workload and pressure from study were merged into 1 dimension. Thus, this scale could be used in different studies to assess students’ educational stress. However, it is necessary to use this tool in clinical and diagnostic activities with caution. Therefore, it is recommended for further studies to be conducted, and the validity and reliability of this instrument be examined in other social groups so that one can use the scale more confidently in different cases. This article was not supported by any specific organization or university. Authors’ Contribution: All authors participated equally in the study. Financial Disclosure: The study was self-funded. Implication for Health Policy/Practice/Research/Medical Education: This research was conducted with the goal of investigating validity, reliability and factor structure of Sun, Dunne, Hou and Xu educational stress scale in Iranian high school students. 1. Mondal J, Shrestha S, Bhaila A. School Teachers: Job Stress and Job Satisfaction, Kaski, Nepal. Int J Occup Saf Health. 2011;1(1):27-33. doi: 10.3126/ijosh.v1i1.5226. 2. McEwen BS, Stellar E. Stress and the individual. Mechanisms leading to disease. Arch Intern Med. 1993;153(18):2093-101. doi: 10.1001/archinte.1993.00410180039004. [PubMed: 8379800]. 3. Houghton JD, Wu J, Godwin JL, Neck CP, Manz CC. Effective stress management. J Manag Educ. 2011;36(2):220-38. doi: 10.1177/1052562911430205. 4. Veena N, Shailaja S. Stress and academic performance. Int J Indian Psychol. 2016;3(4):71-82. 5. Lal K. Academic stress among adolescent in relation to intelligence and demographic factors. Am Int J Res Hum Arts Soc Sci. 2013;5(1):123-9. 6. Mulyadi S, Rahardjo W, Basuki AMH. The role of parent-child relationship, self-esteem, academic self-efficacy to academic stress. Procedia Soc Behav Sci. 2016;217:603-8. doi: 10.1016/j.sbspro.2016.02.063. 7. Rao AS. Academic stress and adolescent distress: The experiences of 12th standard students in Chennai, India. Arizona: Phoenix, University of Arizona; 2008. 8. Ghosh SM. Academic stress among government and private high school students. Int J Indian Psychol. 2016;3(8):119-25. 9. Sun J, Dunne MP, Hou XY, Xu AQ. Educational stress scale for adolescents. J Psychoeduc Assess. 2011;29(6):534-46. doi: 10.1177/0734282910394976. 10. Lovibond PF, Lovibond SH. The structure of negative emotional states: comparison of the Depression Anxiety Stress Scales (DASS) with the Beck Depression and Anxiety Inventories. Behav Res Ther. 1995;33(3):335-43. [PubMed: 7726811]. 11. Samani S, Jokar B. A Study on the reliability and validity of the short from of the depression and anxiety stress scale (DASS-21). J Hum Soc Sci. 2007;26(3):65-77. 12. Connor KM, Davidson JR. Development of a new resilience scale: the Connor-Davidson Resilience Scale (CD-RISC). Depress Anxiety. 2003;18(2):76-82. doi: 10.1002/da.10113. [PubMed: 12964174]. 13. Samani S, Jokar B, Sahragard N. Effects of resilience on mental health and life satisfaction [In Persian]. Iran J Psychiatry Clin Psychol. 2007;13(3):290-5. 14. Meyers LS, Gamst G, Guarino AJ. Applied multivariate research: design and interpretation. London: Sage Publications; 2006. 15. Pallant J. SPSS survival manual: A step by step guide to data analysis using SPSS. 4th ed. Maidenhead: Open University Press/McGraw-Hill; 2010. 16. Kerlinger FN. Foundations of behavioral research. 3rd ed. University of Uregon; 1986. 17. Arsenio WF, Loria S. Coping with negative emotions: connections with adolescents' academic performance and stress. J Genet Psychol. 2014;175(1-2):76-90. doi: 10.1080/00221325.2013.806293. [PubMed: 24796156]. 18. Wilks SE. Resilience amid academic stress: The moderating impact of social support among social work students. Adv Soc Work. 2008;9(2):106-25.